People are pretty het up about Obama's plan to reform health care in this country, and no wonder. The current system is confusing, discriminatory, ineffective, heinously expensive, and ours, dammit. If we'd wanted great guaranteed health care at a great price, we'd be French. This is America! Why would we give a government bureaucrat, maxed out at a GS-19 pay scale, the power to deny care when it could be denied by an insurance company and generate some really mind-blowing profits? The health care industry in this country has a kabillion of our hard-earned dollars, so naturally we're very protective of it. And entities with a kabillion dollars do not customarily sit on their hands and whimper when they're threatened, no sir. A kabillion dollars can buy you a whole fleet of politicians, news organizations, and pudgy radio entertainers. A kabillion dollars enables you to manufacture pure crap out of thin ether, sprinkle it on the masses and make them swear it's maple sugar. Who eats this crap? Why, you'd have to be dumber than sheep. So thousands of folks, enraged and woolly, have flocked to town hall meetings, carrying signs and carrying on. You've probably read about some of them. And, of course, famously, there is the fellow who bellowed "Keep your government hands off my Medicare!" He was later seen petitioning the sun to quit blocking all the light. Is it really in the interests of the spec ies to provide this gentleman with health care? Liberals believe that they must, although they wistfully suggest that, at the least, he might be constrained from operating machinery. Forklifts, voting machines. Many important public figures have gotten into the act. Representative Roy Blunt, Republican from Missouri, declared that, at age 59, he would be denied a hip replacement if he were in Canada or the United Kingdom. This assertion is demonstrably untruthy, and to his credit, when this was pointed out, he apologized and retracted his statement. "I misspoke myself," he admitted solemnly. "I meant to say that in Canada or the United Kingdom I would be required to demonstrate my worthiness to the government bureaucrats by hopping on my good leg for six or seven months while wearing a chicken suit." Apology accepted. 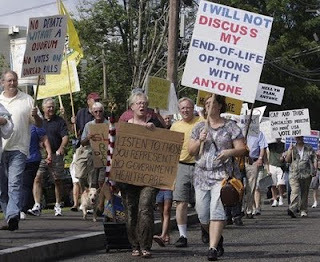 Then Sarah Palin, in a bid to wrap up the 2012 nomination of the Loonycakes Party, brought up the terrifying prospect of Obama's Death Panels, groups of government bureaucrats which will convene for the purpose of deciding whether your grandma will be allowed to live. And there may indeed be much to fear from socialized medicine. Certainly our socialized public school system has let us down, in terms of delivering a thoughtful and educated citizenry. That said, we must here salute Mrs. LuVerne Thompson's talented class of seventh-grade boys, who were responsible for the widespread dissemination of the photos o f Obama with horns, a tail, and a Hitler mustache. (Some suspect Photoshop, but according to Mrs. Thompson, "it's all real, honey. Those horns and tail were created using stem cells ripped from one of our Lord's precious potential snowflake babies, which He in his good time will dig out of the freezer just as soon as He rounds up another four-hundred-thousand wombs.") The rest, however, is almost certainly bogus. 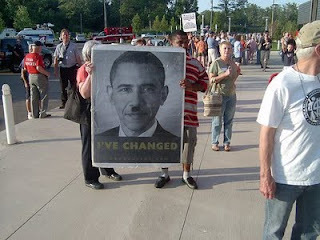 Even Obama's detractors admit he's way too cool for the Hitler mustache. But they still defend the basic allusion. After all, the health industry draws a comparison between health care reform and the worst of Nazi Germany for a very good reason. And that reason is that the Spanish Inquisition no longer packs the same punch. Liberals are appalled at the analogy. But just wait until word gets out about Obama's secret plan to supplement the Food Stamps program with parcels of grandmother meat. It must have been a festive atmosphere at the jail on Bring Your Child To Work Day. There was probably a limit to what could be done to entertain or educate the children, but somebody got the idea to gather them together in a circle, have them hold hands, and--just for yuks, mind you, and a little physics lesson--zap them with a stun gun. I can see how the idea could come to a person. I guess it was quite the event, though. Somebody's mommy got all upset, and felt a lawsuit coming on. Back when I was coming up, we didn't have Bring Your Child To Work Day. That started in the seventies as a thing just for daughters, but in the fifties our mommies were all at home. Daddies were at work, but with all our needs met at home, we didn't really care, or know, what they did. I still don't know exactly what mine did. But I do know we could have been lined up and Tasered and no one would have thought to make a federal case out of it. A fair portion of the kids, all of them male, would have thought it was cool, and gone home to see about peeing on a battery. An even bigger portion would have figured that, whatever it was, they had it coming. Most of us wouldn't have thought of questioning the acts of a grown-up, accepting even derangement as within the norm of adult behavior. And a few, like me, would have figured: hey. At least it's not as bad as Recess. I liked the idea of going out and playing in the sun for a half-hour as much as the next kid, but in practice Recess was sort of an ordeal. I was always the smallest and youngest kid in class. It was a snap to knock me over. When I was really little, my favorite group game was Duck, Duck, Goose. Mostly that was because it involved getting pats on the head, but there was also the giddy anticipation building up as to who would be the Goose, although it was usually me. No child in history ever tapped me for Goose and got caught. For one thing, the smack on the head always bowled me over. By the time I got my feet under me and scrambled up, my quarry had already run around the circle and taken my place. But it was still kind of fun. Then when we got older, we played a lot of games with balls, big turgid balls in public-school red, and that represented a whole new technology with which I could be knocked over remotely. 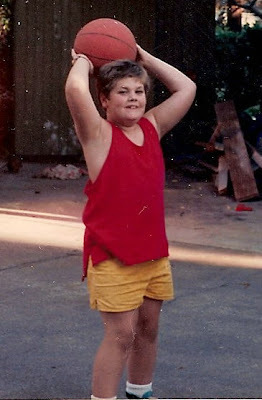 Mind you, I was not only little, but inept. I had already knocked myself down playing tetherball, twice. I was alone at the time. The standard game was kickball. It was played much like baseball, only--and here's the fun part--you could get a runner out by throwing the ball at her. In the head, hard, if you wanted to; the teachers were all inside smoking. The pitcher would roll the ball towards the kicker, who could request any of the four combinations of slow, fast, smooth and bouncy. I always called for Slow and Smooth. That was because any of the other choices was likely to bowl me into the backstop. As it was, I had to kick the ball with the side of my foot to keep from crushing my toes. So the ball invariably scooted languidly off my foot in the direction of third base, and was readily scooped up by the pitcher, who had all the time in the world to knock me clean off my slow trajectory towards first. Other times, the game was just stripped down to its essential and sinister elements: dodge-ball. Here, all the boys whose mothers shopped for them in the Husky department lined up with evil enthusiasm and hurled the missile at each other at close range. As a small and dentable person, I cowered in the back like a sentient tenpin. Theoretically, you were supposed to try to catch the ball, but I could just as easily have snagged a meteor with a guppy net. It made a body look forward to going back inside to study long division. I'm a grown-up now, and although I am still famously wobbly, I no longer worry much about people knocking me down. The Husky boys have grown up too; they're selling cars and hanging sheetrock and writing briefs. A couple of the ones who were shaving in third grade are probably still out there pounding on people; maybe defending the sanctity of their third, fourth and fifth marriages. But they're leaving me alone. The other day, the police pulled over a pantsless man on the freeway. He was doing 69 in a 50-mph zone. However, it was the speeding that got the cops' attention. When asked, the fellow explained that he had lost his pants. The cops searched the car but didn't find any pants. Well, duh. When I lose my pants, I never look in the car. At least, not since the seventies. Nor do I drive off to look for them. Most of the time, I stay right at home until the condition clears up. If truth be told, most of the time my pants are more abandoned than lost, although it might feel the same to the pants. However, there are probably many reasons a man might drive around without his pants on, and one of them is surely the reason the man gave. Your whole life shouldn't have to come to a crashing halt just because you lose your pants. Nobody'd get anything done in a world like that. There are still things to do, places to go, people to flash. But it's still a good idea to avoid committing a serious crime under the circumstances, unless you enjoy the attention. Oh, sure, there is a crime for which pantslessness is practically a uniform, but that's an exception. You hardly ever hear about a bank robber, for instance, who isn't wearing any pants. Whereas it's true that the very act of robbing a bank requires a certain kind of personal equipment, you don't want that equipment to be readily identifiable in a line-up. You're too likely to be fingered. Just came back from a gorgeous and nearly deserted hike on the Loowit, the timberline trail around Mt. St. Helens. There are signs on the trail suggesting what to do if things start to rumble and pop, with specific instructions for avoiding flying boulders and a suffocating ash plume. I'm thinking that, for me, the first step would be to bend over, but I took note of their suggestions anyway. Even without a lot of elevation gain, it's a workout. The terrain is unstable and requires a lot of clambering over boulders. But there was an ocean of bear grass blooming, the most I've ever seen in one place. An individual bloom of bear grass is utterly compelling to most men, and a sea of it is grinworthy for anybody. Stea m from the lava dome curled up suggestively in the background. Three young men heading our way, one wearing a hard-hat, reported that the washouts were a little "tricky" but there were marmots near our destination for the day. I adore marmots. I love their chosen alpine landscape, their neat little underground cupboards and their aspiration to fatness. Everything. The trail sign and all the guides warned us about washouts, too, but the word itself just doesn't carry much of a threat with it. One almost imagines that the scenery has merely faded a little. We crossed a few washed-out gullies with a little whoopsie-slide here and a boulder-hop there, seeking out small cairns and flags that previous hikers had placed to redirect us to the trail as it continued on the other side. Then we came up to the crest of a major ravine which had been scoured out by winter floods. The slope was about eighty degrees of loose pumice and sharp pointy rocks with no particular resistance to gravity. The trail as we had come to know and love it was nowhere to be seen, but we could make out a narrow traverse in the pumice that was entirely adequate for voles, assuming they went single file. I was in the lead and started down. I may have made it halfway, secure only in the knowledge that other people had already negotiated this trail, including our friends from earlier, when we saw a couple with large backpacks coming our way from the bottom of the ravine. They waited there because we were definitely in a no-passing zone. We hollered greetings. They said it was worse going up the other side. I froze on the slope while we discussed whether to go on to Marmotville. Mother Nature had gone to some trouble to create this here moonscape, and the ravine, from an aesthetic standpoint, was lacking only a crumpled-up, dented and abraded middle-aged woman at the bottom to really shine. "It's up to you," Elizabeth and Dave agreed, and I wavered for a bit, considering my options. There were three. I could pick my way slowly and laboriously to the bottom of the canyon. Or I could arrive at the bottom in a few seconds. Or I could hike back the six miles we'd already come, drive back to Portland, drive all the way back another day and start at the next spur trail over, hike in another six miles and backtrack to what would be the other side of this canyon and I'd be right there in Marmotville. This seemed much the easiest plan. "I think I want to turn back," I admitted in a wretched tone of voice. Elizabeth and Dave were probably plenty relieved I'd decided to turn around, and, as a bonus, would have me to blame for our lack of fortitude. Unfortunately, the distance I'd already traveled in the washout, just on faith and a dab of momentum, was entirely daunting now that I'd had a few minutes to work up a froth of adrenaline. I just about couldn't bring myself to make it back. I froze at every crumbling, sliding, boulder- and bowel-loo sening step. And now, of course, we had witnesses. Once I got back on relatively solid ground, it was everything I could do not to turn back and yell out to our friends at the bottom of the ravine: "I'M FIFTY-FIVE!" That would have given the wrong impression, though. I'm not decrepit or fragile. I'm just a huge wiener. Ever since I was a kid, I was very precise about my fears. "I'm not afraid of the dark," I'd explain. "I'm afraid of the things that come out of the dark." Or, "I'm not afraid of heights--I'm afraid of falling off them." Oh, I have fears. Elizabeth was sympathetic. "I never like to do anything that's dangerous," she admitted, and I agreed, as we skittered and slid back over the active volcano. Our family was having a fine time at the old homestead. Balfour, North Dakota, population twenty, was a prime vacation destination when we were children, world-famous--we assumed--as the Home Of Grandma. Now we were adults and the hayloft and silage pit no longer held the same appeal. 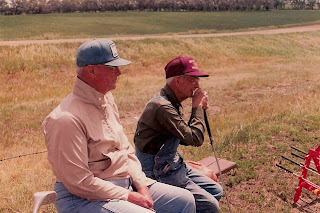 When Uncle Cliff noticed us passing the time chipping golf balls into a gopher hole, an activity that annoyed the grasshoppers no end, he suggested we go southeast a few miles for a real game. The clubhouse at the Drake Golf club was closed so Elmer could get his hay in, but the course was wide, wide open. Cliff tucked two dollars per player into the little envelopes provided and slipped them into the slot like a church offering. He allowed as how we could use some of his clubs. 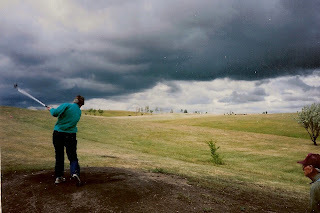 He himself used only one club, homemade, with a massive leaden head and almost no loft at all. It had something of a Neanderthal aspect to it. And he also had a putter. Dave selected a shiny, unmarked nine-iron from Cliff's bag, confident it had 150 yards in it, and teed up, hair streaming behind him. The wind was coming straight out of the north, having originated somewhere in the Yukon and barreled south without resistance for a thousand prairie miles. This, in short, was a breeze with some pop to it. Dave gave his ball a good fat whack. He watched it sail into the distance as a small dot, hover, and then get larger and larger before everything went black. We figured he was bound to come to before the next hole. Then Cliff and his friend Jake got down to business with their giant honking clubs. Cliff had a cranky hip, and Jake needed rocks in his pockets to stay earthbound, but they had the home field advantage. Either one of them could decapitate a column of prairie dogs with a single drive. Cliff's and Jake's balls skimmed over the fairway like stealth bombers and thunked onto the green. The second hole was a dogleg to the right. It was easy enough to make out the doglegs; they were defined by barbed wire, with the fairway distinguished from the rough by the relative absence of cow flop. 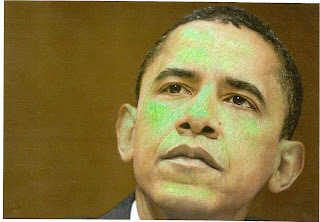 I figured I could make the green on the diagonal. But that, I was informed promptly, was cheating. First you drive west, then you hit north to the pin. The trees at the Drake Golf Club were of the variety common to the rest of North Dakota: imaginary. You are expected to assume the trees. About the greens. They were brown. Sand, in fact. They were perfectly circular. The hole was dead center. 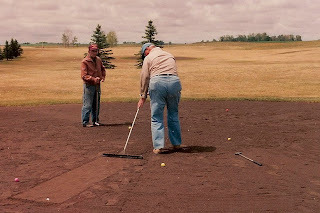 And what you do, at the Drake Golf Club, is you pack yourself a smooth little pathway into the sand, from the ball to the cup, and you putt. There's a roller on a stick at every green for just that purpose. In the interest of moving things along, everyone uses the same pathway. It's up to you and your conscience to eyeball the distance you landed from the cup and place your ball at the correct radius. Flip the roller over, and there's a rake for tidying up your footprints when everyone has putted out. The Drake Golf Club has challenges rarely encountered on another course. I would not want to generalize about the sort of stuff a man needs to prevail. But let's just note that the two players who had dry-farmed through the twentieth century and tallied up decades of North Dakota winters without indoor plumbing rolled to an easy victory. Still, I look forward to trying out the local bowling alley. The prairie dogs would be less of an issue, and I'm hoping the gutter goes right down the middle of the lane. I have a long tendril of music curling around my brain these days, as usual. 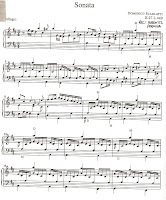 This one is a Domenico Scarlatti sonata, one of his early ones, and he was an early guy anyway. That means that somewhere in the neighborhood of three hundred fifty years ago, Dom (we have a relationship) dashed off a little ditty and it still lives on in my brain today. Let's one of us try to pull that off. It's in there on a loop, a constant undercurrent I can plug into whenever I'm not busy with something else. And it's living in my brain because it isn't living in my fingers, yet, but it will soon. We've got a few of the standard modern toys, although fewer than most people. Our TV is acknowledged by all to be little and crappy. But the older I get, the more I want to sit in a room and play all of this old stuff--lots of baroque, but a lot of Brahms and Chopin, too, and some of those guys didn't make it all that easy. It's all gorgeous and rewarding and way better than anything I might come up with on my own. And it's already written down, so instead of having to make a nice painting or sculpture or quilt or piece of writing, all I have to do is plate it up and serve it. If I work hard enough, I can pull that music right through the centuries and induce the sort of rapture other people wring out of religion. I was born right in the middle of the twentieth century, in a year so bland that literally nothing else happened. Well, Queen Elizabeth figured prominently, and Sir Edmund Hillary, but that was about it. By the time the Y2K business was coming around, I was eager to enter a new century, but I sort of had the nineteenth in mind. I wanted to sit and read, sit and paint, sit and sew, putter in the garden, take constitutionals with my swain, and have people over to the parlor for chamber music--only with good lighting and elastic-band pajamas. I've resisted cell phones and Blackberries and iPods and the need to be on the communications grid all the time because it makes my head vibrate unpleasantly and makes the Scarlatti tendril hard to hear. But now I have and enjoy a computer, am on YouTube, have my own blog and a Facebook page and think it's all pretty swell. I have one foot in the nineteenth century, one foot in the twenty-first century and I don't know what that is I've got hanging over the twentieth. It was August 3rd, the birthday of Andrea (the good niece). In her honor, Elizabeth (the bad niece) attempted to leave me for dead on the slopes of Mt. Rainier. She will probably claim otherwise, but she can get her own dang blog. To be absolutely fair, Elizabeth probably wasn't initially trying to kill me by hauling me up there. As she brought up eight or nine dozen times that day, I'm the one who is famous for dragging people up mountains against their will. I don't mean to be difficult. It just so happens that a lot of the things I think are worth looking at are way up high, and we're down here practically at sea level, and I tend to believe anyone with sufficient peanut butter should be able to bridge the elevation gap. Furthermore, I like to believe that there are a lot of people out there who are secretly--very secretly--grateful to me for making them spend all day on a trail so steep you can reach out and touch it in front of you. At any rate, neither Elizabeth nor I suspected I'd be the one bounding up Mt. 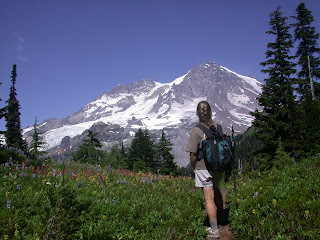 Rainier with all the gusto of a ninety-year-old asthmatic. It didn't even start out well. We popped onto the trail with the usual vigor, and within a few hundred feet I made the announcement that I'd be slowing things down until I got my second wind. Turns out I didn't have one. I never kicked it into a gear past Trudge the whole day, and felt distinctly ill and fatigued to boot--the kind of feeling young people blame on what they'd ingested the day before, and old people blame on being close to death. About halfway up, Elizabeth commented on our good weather. "Fwabbadabby bort," I observed. Elizabeth was alarmed. "Have you had enough water?" she wanted to know. "Biscorpal!" I assured her. "When was the last time you peed?" she asked--impertinently, I thought. I flapped my hand limply downhill towards a point quite distant in both space and time. "You've got to drink more water, now," she insisted. "Bawa," I agreed. She uncorked the bottle and watched me drain it, like a little Nurse Ratched dispensing meds in the looney bin. Elizabeth had never seen me this feeble and might have been a little worried. 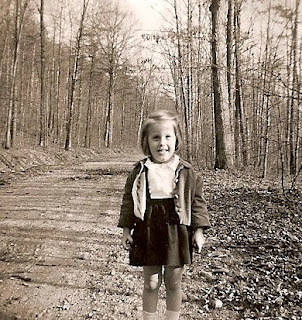 After all, she knew she probably couldn't dig more than a shallow grave in that rocky soil. We continued upslope at a glacial pace. I was enveloped by a vortex of flies who were probably trying to get a jump on things. We finally crested a ridge at about four miles and were rewarded with meadows of flowers. "Look at those beautiful lupines!" Elizabeth enthused. "Boopings!" I agreed. Elizabeth brought out more water. I don't know where she found that goose-gavage funnel she used to get it down my gullet. Still hadn't peed. We plodded onward, and were greeted heartily by a jaunty fellow at least fifteen years my senior. He was unbearably upbeat. "Yeah, you're almost there!" he sang out. "Just a couple more little uphills and you'll hit the Wonderland Trail." He shrugged off a massive backpack and reclined against a tree, smiling. A couple more little uphills? Thanks, Pops. When you get back to civilization, have them send up a helicopter. The two little uphills added another thousand feet of elevation gain, for a total of about 3700 feet in five miles. Pops was merely the first in a series of sturdy, smiling and thoroughly annoying septuagenarians, their legs churning like pistons. We met Pops one more time after we turned to go back. "Did you get to the lakes?" he wanted to know. We hadn't. "Good for you--leave something for the next time!" he said. I will say, he looked durned hard to murder. I had put away about three quarts of water before I finally had to pee and Elizabeth left me alone. Looking back, I can only imagine that the previous week was to blame. I'd given a pint of blood, and it had been two hundred degrees in Portland for days on end, days in which I had drunk massive but apparently inadequate amounts of water. The human body is supposed to be more than sixty percent water, but I had done a little economizing and gotten it down to a nice tidy forty percent. All the cells in my body had gone gummy, and all the wa ter I'd drunk on the trail had been devoted to re-inflating them, leaving the brain cells for last, before any had elected to tip into my bladder. "You have to admit that those meadows on top were stunning," Elizabeth said. And I did have to admit that. They were almost as stunning as the ones we drove right up to the next day, right off the parking lot of the Paradise Lodge. The second sound you heard the other evening was the sound of me weakly stabbing myself in the head with an ice pick. The first sound was my neighbor saying "it's supposed to get down to 104 degrees tomorrow." It is not possible to lay your wrist veins open with an oscillating fan. The blades just quit. The cord from the ceiling fan is not strong enough to hang yourself from. Spoiled fruit will not kill you outright. If you put your head down and charge straight into the pointy corners of the refrigerator, it feels pretty good until you come to again. Thighs can be removed from a plastic lawn chair by gently inserting an ice pick under the edges and prying up. To remove skin from a metal lawn chair, allow to bake until crisp (fifteen minutes), scrape up with a spatula, add barbecue sauce and serve. All the doorknobs are hot. Just open it and go in. Just because the toilet seat is unusually warm, it doesn't mean it's turning Japanese. You can wait all day, and it's not about to squirt water at you or dry you off. You're still on your own. Your local newspaper is offering helpful tips to cope with the heat, right on the front page. "Wear Sun Hat" is one, accompanied by a helpful drawing of a Sun Hat. "Seek Shade" is another. There is a helpful drawing of a generic tree in profile with a dark spot next to it, an arrow pointing at the dark spot. You are one of the last fifteen people who still subscribe to your local newspaper, and your local newspaper suspects you are a moron. Black fur absorbs heat. Fur can be removed from the thighs with a damp sponge. Cats can travel about fifteen feet in the air before returning to earth. The Band-aids are in the pantry. There is a temperature above which your computer tower will actually begin to pant. Windows Vista, however, still freezes. About ten degrees before the point at which life ceases to exist, humor dies. I am not funny. You are definitely not funny. Why, yes, it IS hot enough for me, thank you! Ha ha! Have you met Mr. Ice Pick? We've all heard of the "Birthers" by now, and isn't it fun? It's like when they found a group of Cro-Magnon people in some isolated island somewhere a while back. Here, in the face of all modernity, was a tribe of ancients who had not evolved in a significant manner since the Stone Age. And now here--right here!--in the middle of an America that had sent a man to the moon forty years ago is a tribe of Birther people without advanced cognitive abilities and who yet are able to lope off to the Burger King and bring down a Whopper. The Birthers believe that we have recently elected as President a man who is not a bona fide American citizen, because he was of foreign birth. Hawaii is a little out there, for sure, but most of us recognize it as a state. So we think of him as being a little more pineapply than the rest of us but otherwise true-blue. The odd thing about the Birthers is that their numbers coincide neatly with a segment of America that, until recently, did not care where or how their President was born, as long as he claimed to have done it twice. So this is new. Most of us get a chuckle out of the Birthers, and speculate as to whether they came about as a result of inbreeding or whether they're the product of a long-underfunded educational system. But the main thing about the Birthers is that they have totally missed the big picture. Even if Hawaii were a real state, which is in dispute--real states raise wheat--it only became a state less than two years before our President claimed to have been born there. The gestation of a human is nine months, reputedly, but aliens have been known to gestate for far longer. And that's the issue. It's not that Barack Obama is a Kenyan. He is out of this world. He has a six-foot wife who wears hot pink. His children are a little too perfect. He never acts perturbed no matter what the provocation. His ears stick out. Something's not right here. The Birthers may have the details wrong, but they're on to something. Pay close attention to the issue of whether or not we should send a man to the moon. Please note that it is always a generic man who is proposed, and not someone specific like Lou Dobbs. So there is no pressing need to blast anyone off. The reason usually given is that we were all so inspired when we sen t a man to the moon forty years ago--what could possibly be more inspiring than to see if we can do the whole thing all over again, especially after all those years of underfunding the educational system? Gosh, not much. I personally agree with a number of scientists out there who believe that it would be a lot more fun and way less expensive to send off a bunch more of those little golf carts that creep about the Martian landscape going eep eep eep and find out all sorts of compelling scientific stuff. 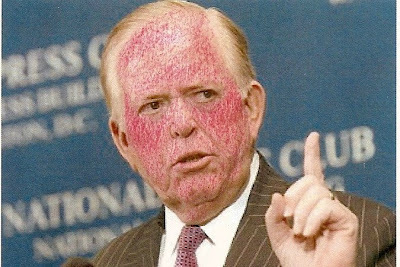 But, instead, we are being urged to fire off another random man to the moon who is not Lou Dobbs, and at great expense. Someone doesn't want us to find the true birth certificate. Someone doesn't want us to go to Mars and come nose to probe with a race of men of color. Green, or whatever.